Most people know that Starling RESISTANT Entrance Holes (SREH) do NOT mean starling PROOF. Though uncommon, starlings have been known to occasionally breech SREH. Once a starling breeches an entrance, it is even more important to dispatch the invasive bird. The fear by most is that smaller starlings that can enter a SREH could possibly breed and create more smaller starlings, and over the course of some years with the help of natural selection, the benefits of SREH would be made obsolete. This would be as tragic and possibly as devestating for the modern day martin as bringing in these pest birds to North America in the first place. Of course, some SREH are more restrictive that others and most breeches have been reported with the less restrictive entrances like a simple crescent or a Conley II entrance. The more restrictive, the less likely a starling can get past it. So a more restrictive SREH like an Excluder entrance would be much safer. One well known fix for the problem of starlings getting in through a SREH, is raising the floor (or lowering the entrance) as many houses use SREH that are placed much to far up. The bottom of a Staring Resistant Entrance Hole should be flush or as close to flush as possible. The lower to the porch, the better. Sometimes, the entrances are placed low enough, it’s just that the starlings are smaller than usual. Take the very popular Troyer Gourds. People love them. They are our best selling gourd…deep, strong, lightweight, pretty awesome really. The entrances are as low as they can go. You can modify the gourd and swap out the entrance for a more restrictive opening, trap the offending bird, or you can try this fix reported by Bradley O. on FB. We would LOVE to hear if this works or not from others who are having a problem with starling breeches in their Troyer tunneled gourds. By looking at his picture, you can see that all he did was clip 2 small binder clips on either side of the Troyer Tunnel. We hope you all try it and let us know if it works! My favorite thing to do is tuck in my martins. I leave the children inside with my spouse, take a coffee (or some other beverage) out on the back patio, and enjoy the show. My purple martins, 35+ at this point, weave an invisible quilt of flight and song. An unseen drain swirls them in closer and tighter until they all swoosh into their gourds in a mad dash to escape one darkness for another. Today a young male Starling made a home of the repeating nestbox trap. One starling down…200 Million to go. Last night an American Kestral gave a half hearted attempt at what I can only assume was harassment. I could almost hear the martin laugh. Though speedy his attempt was awkward and clumsy and he flew off in disgust with himself. Maybe his eyes were bigger than his stomach as I am not sure what he would have done if he had caught a martin. Another female ASY purple martin came yesterday bringing the tally up to 5. Also, as if on cue, one of the starlings that had been trying to get in the Troyer horizontal gourds finally went for the trap. 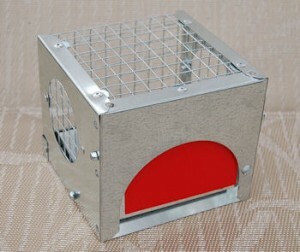 Thankfully the repeating nestbox trap or S&S repeater, worked like a charm. I took a few pics of the poor fellow and humanely deposited him in the circular house at the curb. My mother in-law was mortified. My husband, as usual, perplexed at how I can euthanize a bird and call myself a bird lover. I answered back the way I always do. 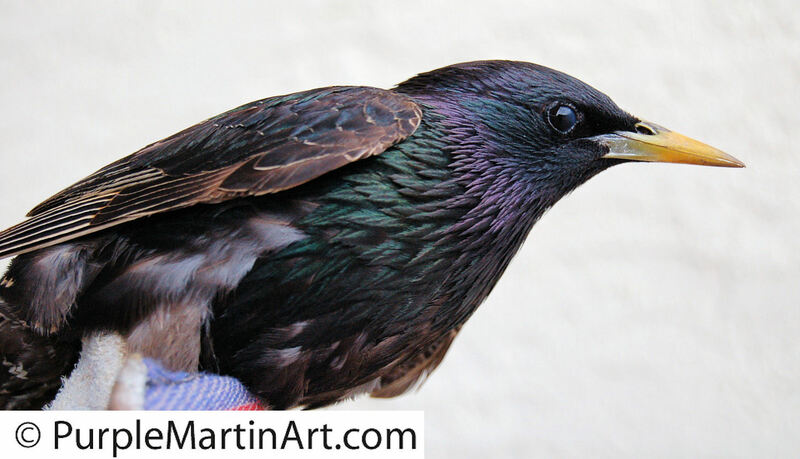 That as a true bird lover, sometimes hard decisions need to be made and “my” purple martins will not suffer for the mistakes humans made by introducing the European Starling on this continent. But look out! 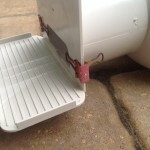 You do NOT want me to take out the soap box again! The live ColonyCam is up and running and it is at a slightly different angle.But I have not heard anyone complain as yet. Yes, last week the purple martin colony cam went online. What is the colony cam? Well, it is the exterior view of a portion of my purple martin colony. Located in Sunny South Florida (Loxahatchee, which is western palm beach county, to be exact) the colony consists of 2 gourd racks and 1 multipurpose pole. The camera is currently on the “numbered” purple martin gourd rack. As of right now there is capacity for 33 pairs but a few more gourds will go up bumping up this years capacity to about 36 pairs of purple martins. Last year 131 purple martins fledged from this site and we hope to do as well this year. As of this morning there appears to be 2 pairs of martins. More should be showing up soon. Since migration appeared to have been delayed due to weather, the time between the ASY or adult purple martins arrival and the SY or sub adults arrival may be shorter than usual. So be prepared and get your houses up. If you live in the northern portion of the purple martins range and don’t expect them till later in the year, feel free to watch them on the web cam which should be running 24 hours a day, 7 days a week…barring any technical issues which sometimes arise. A few European Starlings keep making early morning visits but will not enter my nest trap. The first day they arrived the starlings tried to enter the trap which was stuck and since then they seem in no hurry to enter it again. Of course, it is working now but as my luck would have it, they wont even look at it again. Instead the starlings will sit and watch from atop the gourd rack and do that drawn out backwards wolf whistle that makes my hair stand up. Like fingernails on a chalk board. Normally the repeating nestbox trap also known as a S&S trap would do the trick and trap them like a charm but alas, you can lead a horse to water… For easy to build step by step plans on how to make your own S&S trap click on the photo above or this link: Repeating Sparrow and Starling nestbox trap plans. 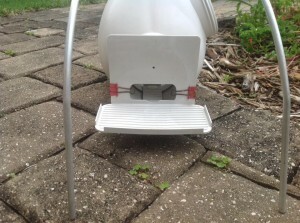 But in essence the trap has a clever teeter totter type mechanism that automatically resets itself after depositing the trapped bird (UNHARMED) in a cage below. A great tool for those that manage bluebird trails as well. Our native birds need all the help they can get! 100% Starling PROOF Entrance Hole? Is it really possible? I saw the ad for this entrance hole in an issue of “Feathers and Friends” and I was immediately interested. 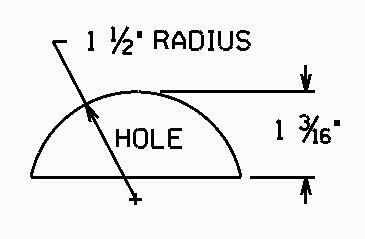 An entrance hole that touts itself as 100% starling proof is a pretty amazing discovery…if true. As you may know, the advent of the original Starling RESISTANT Entrance Hole (SREH) by the late Charles McEwen was revolutionary for purple martin landlords. The fact that purple martins could be protected from the destructive European Starlings was a huge development. Some purple martin house manufacturers went so far as to make these SREH standard equipment on their houses and countless martins are now, for the most part, safe from these pests. Almost immediately after the SREH was placed into use, it seems that the search for the elusive, perfect and 100% Starling Proof entrance was on. Many landlords have been actively developing different entrance shapes trying to keep out the occasional smaller sized starlings. Some folks have even hypothesized that in using SREH, that we are in essence been breeding down the size of starlings. If that happens the purple martins will have no protection from these invasive birds that are choking out our native cavity nesting birds. The immediate benefits of SREH still outweigh any other risks involved. (Risks such as wing entrapment can be serious and deadly- read about wing entrapment HERE. Consider that European starlings are even displacing red bellied woodpeckers in order to take over the nesting cavity. Countless woodpeckers are now being forced to excavate several cavities and nest later in the season in order to deflect the pressure of the starlings. Late clutches are usually not as productive. So not only are the secondary cavity nesters in peril but the primary excavators are also at risk. Habitat loss due to urban sprawl and deforestation, in time the starlings will impact woodpecker populations. It would seem that would decrease the amount of natural nest cavities available to secondary cavity nesters such as flycatchers, screech owls and even wood ducks, just to name a few. Human supplied bird boxes or nest boxes will become even more vital in saving our native birds. Perhaps then more emphasis be placed on active control and even local eradication of European Starlings. 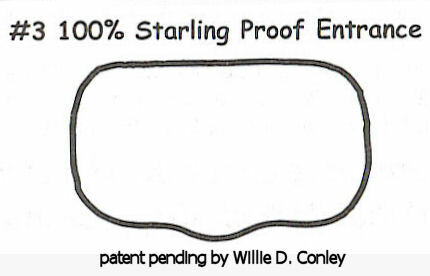 Back to the question of this “100% starling proof” entrance. We will have to wait for those of you that use it to let the rest of you know. I do not have a heavy starling area but I may very well get a few of these just out of curiosity. In appearance it is very similar to the Clubhouse entrance (or Conley #2) only more narrow. The Clubhouse entrance is the SREH on the current Troyer Horizontal gourds and was named after the Purple Martin “Clubhouse” forumites that developed it. For purchasing information contact “Nature Unlimited” at (260)593-2624 ext 1. This is an Amish run country store so a voice mail should be left and they will call you back. Entrance plates are $1.95 each and are 4 -1/2 inches x 3 -1/4 inches. PLEASE let me know if they work for you. Not that I am not grateful for the rain that South Florida so desperately needs. I really don’t want the rain to go away. Just give me enough time to take care of business on the 3 poles. South Florida has had torrential downpours in the last week or so as a result of a low pressure system that was actually threatening to turn into an early Tropical Depression. Hurricane season can’t wait to start, apparently. The nest checks could wait no more. Last nest check of the numbered gourd rack had gourd # 10 smelling quite ripe and needing a change badly. The babies all fledged successfully in that nest but yesterday as I watched the birds coming in for the night, I noticed that no one wanted to enter that gourd. So I was finally able to do several nest changes in empty gourds that had already fledged on the numbered rack and also changed several nests with babies on the lettered rack. The smell was reminiscent of the monkey cages at the Bronx Zoo and General Tso’s Chicken from the neighborhood Chinese restaurant. I doubt I will ever be able to eat General Tso’s Chicken again. Thankfully my experience as a nurse and mom has prepared me well for the foulness of the situation…5 straight days of sideways falling rain, plus bird poop, plus “bug parts” was turning into a potent compost material. I am convinced that had I not changed the nests for some of the nestlings that some will have perished in short order. The nestlings in Gourd “D” were wet and dirty. They seemed grateful to be placed back in a dry clean nest. I noticed one of the nestlings had a small lump on its abdomen that reminded me of a cyst or a tumor. Hopefully it is benign but I will observe it. All but the telescopic pole was checked as thunder was rumbling again and a drizzle began to fall. Last night I had the strangest dream. In the dream I heard the wolf whistle call of a starling. Then this morning when I went outside to check on the birds and check the trap, as I ALWAYS do. To my surprise I looked down at the trap and I see a bird in the trap. At first I thought it was a fledgling martin that let his curiosity get the better of him. When I looked closer I saw that it was not one but 2, yes TWO Starlings in “the little repeating nest-trap-that-could”. There are some half dozen starlings frequenting the yard and I decided to keep the younger of the two as a lure. Now to just work on my baited trap. I was glad to be able to get some good up close photos of the European Starling and several came out quite well.